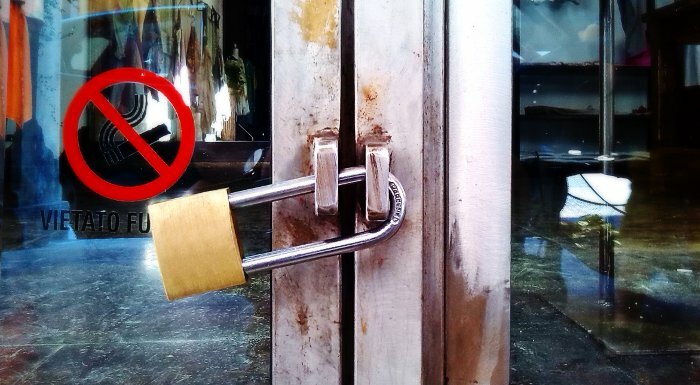 There is a suitable padlock for every use. How do you choose it? Even in a general hardware store it is usually possible to find many kinds of padlocks; choosing the right one for you may not be easy. Let’s looks at some simple tips to help us. Shackle type padlocks should only be chosen when you need to pass through small sized fixing points. The common shackle type padlocks are the most widespread, but they are also potentially the most easily attacked, because, unless fixed with hooks of a particular shape, leave the shackle very much exposed, so that they can be cut, sliced ? ?or ripped with saws, shears or simple levers. Unless there are special reasons which require their use, it is better to prefer lock-bolt solutions, such as the padlocks for roller shutters. 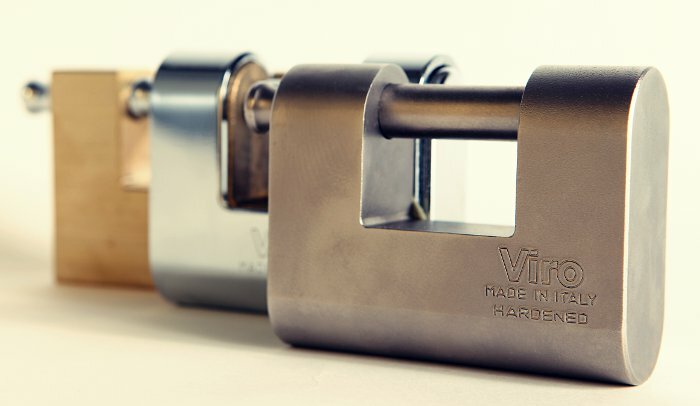 It may seem obvious, but it is important to remember that, if the same materials are used, a padlock with a larger body and rod is generally a more resistant padlock, because larger shackles, rods and bodies are more difficult to cut or break. 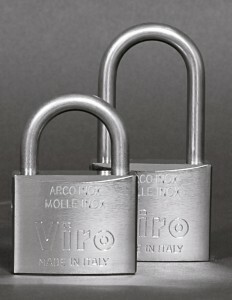 The serious manufacturers offer a wide range of sizes for each model of padlock. Armoured padlocks have the brass body protected by steel armour, whilst one-piece padlocks have the entire body made directly of steel. These solutions are considerably stronger than padlocks made of aluminium or zamak (zinc-aluminum alloy) and also those with the body made of exposed brass. 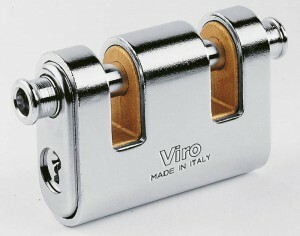 The Viro Panzer is one of the most widespread armoured padlocks. 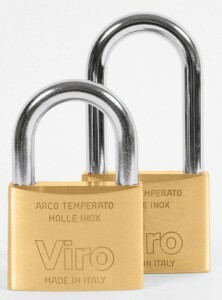 The Viro Monolit is a good example of a one-piece steel padlock. 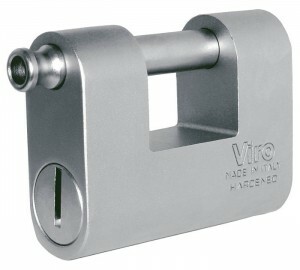 The roller shutter padlock, especially if it is armoured or one-piece, offers considerable security, since once it is closed it leaves little or none of the rod exposed, and in the best models it also rotates to prevent cutting and is equipped with a programmed breakage lock-bolt head, to prevent ripping. These locks are therefore the ideal solution not only for locking shutters, but also for gates, bolts, chains and, in general, they are recommended whenever it is physically possible to use them. 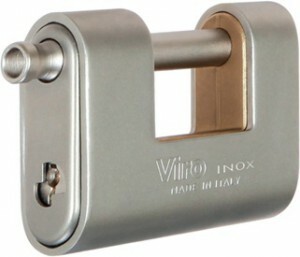 Various types of roller shutter padlocks. 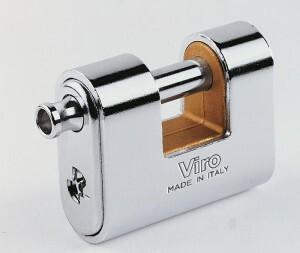 A special type of armoured padlock is that of the dual slot padlocks; they are recommended every time it is necessary to close two eyelets placed at a certain distance or when you want to be able to detach one side of the lock, leaving the padlock attached to the other side (for example, on double doors or in a use with chains). Amongst the many alternative models of the Panzer Viro there is also the dual slot type with independent rods. Chains can be locked with shackle or armoured padlocks, but the best solution is without doubt to use padlocks designed especially for chains, which have the advantage, although armoured, of being more compact and easier to transport. Also, given that they are arranged in the same direction as the chain, they do not shorten them; on the contrary, they increase the useful length. Padlocks for chains are one of the many innovations introduced on the market by. The use of marine padlocks is recommended on boats, near to the sea and in all situations where the environment is damp and corrosive; these padlocks are specially designed and manufactured to withstand even the harshest conditions. The Sea and the Panzer stainless steel padlocks produced by Viro are made of materials and with designs which make them resistant to even the harshest environmental conditions. 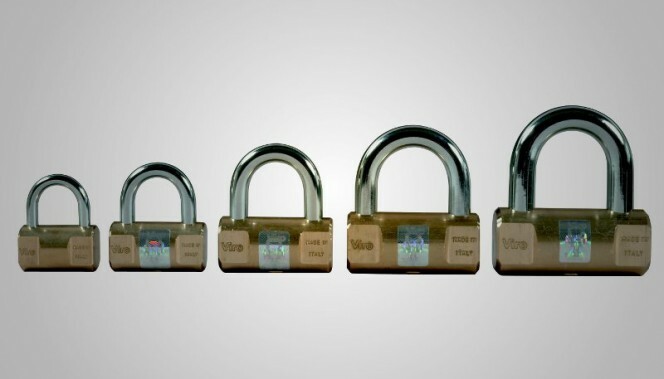 Padlocks with a long shackle are less secure than the corresponding normal shackle type padlocks, with bodies of the same size, as they leave the shackle even more exposed, and because the length of the shackle amplifies the effectiveness of any lever used to break it. 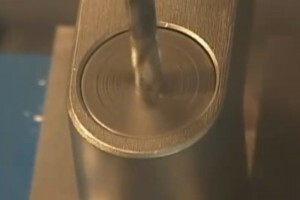 They must therefore be used only when the two fixing points are far from each other and do not allow the application of other types of padlock. An example of a padlock with a long shackle used inappropriately, where it would have been much better to use a roller shutter padlock. 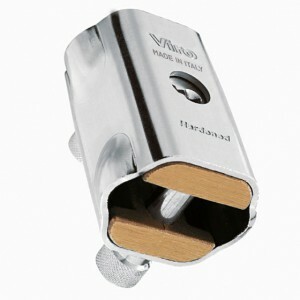 The best padlocks have the locks protected against attacks with a drill by means of a special security plate. A rotary plate is an excellent drill-resistant protection, as it rotates together with the drill bit, preventing it from drilling. Vans and commercial vehicles are often seen in circulation with the doors closed by padlocks. This is certainly a solution which would offer greater protection than standard locks, but even better would be to use products specifically designed for this purpose, such as the Viro Van Lock; they are more practical (they remain anchored to the bodywork and close by pushing), secure (they have a pull-resistant elliptical body and a drill-resistant plate to protect the lock) and are long-lasting (they are made of stainless steel). 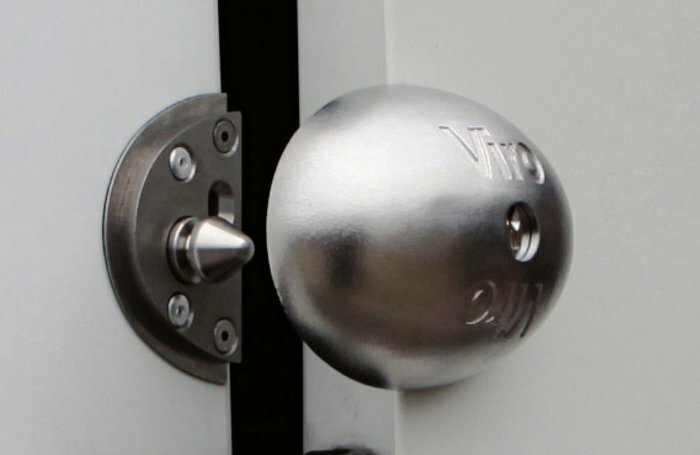 The Viro Van Lock is an additional security lock for commercial vehicles which is much more practical and secure than a padlock applied to the door. The wide range of choice in the field of padlocks can be confusing at first and, out of habit, you may be tempted to buy any type of padlock. But, if there are many different products, it is because these are able to better satisfy many specific requirements. It is therefore worth taking a few minutes to look for the best solution for our particular needs. Also in this case, as in general when it comes to security products, we can resort to the help of a good retailer who will know what to advise. This entry was posted in Padlocks and tagged tips on 7 September 2015 by Mara Rossi.